Lam Jou (Lam Cho), also known as Lam Kungau, was born in Gwongdung Province, Naamhoi district, Pingjaau village. His parents passed away when he was a small child. The young orphan was adopted and raised by his uncle, the famous Lam Saiwing, the student of legendary Wong Feihung. „Porky Wing“ had no sons of his own, so he loved him as his own child and taught him everything he knew. When Lam Saiwing was invited to live and teach in Hong Kong soon after the fall of Ching Dynasty, young Lam Jou followed his uncle and made the former British colony his permanent home. Lam Jou started to train gungfu when he was 6 years old. 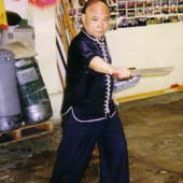 Besides martial arts, he also focused his studies on dit da yi fo, traditional Chinese medicine for bone setting, bruises, and tendon and ligament strains. Lam Jou was not only a natural athlete, strong, fast and agile, but intelligent and hardworking, too. He mastered all the different aspects of the gungfu training very quickly. Being only 16 years old, he was already a martial arts' teacher on his own – first he assisted his uncle in teaching at his Southern Martial Physical Culture Association (Naam Mou Taaiyuk Wui) and eventually set up his own gungfu studio and ditda clinic. Thanks to his skill and technique, he was well known in the martial arts' circles throughout the whole of Southern China and was called "sifu" even as a young man. Being so young and already having his own school, he had to prove his abilities in many challenge matches. Lam Jou has taught a lot of students – many of them opened their own gungfu schools and made the gungfu of Lam family popular throughout Hong Kong and Southern China, like Chan Honjung (Chan Hon Chung), Ho Sigit (Ho See Kit), Wong Lei (Wong Lee) or Jiu Gaau (Chiu Kau). Lam Jou was invited to perform his art for the British navy and army. His skill awed both the Chinese and foreign audience and articles with his photo appeared in many newspapers, even in London. After the Japanese invasion of Hong Kong during World War II, civil disorder broke out in the streets. Lam Jou tried maintain the peace and help the people in their suffering. His deeds are still remembered to this day. He refused the privileges the Japanese offered him. So his studio was burned down and he had to escape back to Gwongdung Province. He hid in his native village and taught secretly the martial arts. After the end of the war, he returned to Hong Kong and reopened his gungfu school and ditda clinic. During the next few years, he became a chairman and a martial arts consulant for various working associations and unions. Thanks to the genius and a vast experience of Grandmaster Lam Jou, the style of Hungga was enriched with the principles and techniques of the Northern styles. He combined power and stability with speed and mobility. Lam Jou was well known for his ability to leap high and land as quietly as a cat and to execute moves as powerfully and ferociously as a tiger. Various weapons and weapon 2-man sets were added. 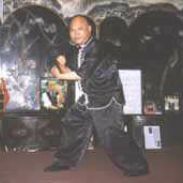 Moreover, Lam Jou is the creator of famous Tiger and Crane Sparring Set (Fu hok seung ying deui chaak). Grandmaster Lam Jou has been teaching for more than three quarters of a century. Currently, within his family, his sons Lam Janfai (Anthony Lam Chun Fai) and Lam Jansing (Lam Chun Sing) continue to carry on the tradition of the family heritage. Some of Grandmaster’s best students, like Boston’s Dang Gwokwa (Tang Kwok Wah) and San Francisco’s Y.C. Wong (Wong Yiujing/Wong Yew Ching) moved to the United States and made the style of Lam family known worldwide. In 2010 celebrated Grandmaster Lam Jou 100th birthday.